The E-M5 Mark II is the new flagship Micro Four Thirds compact system camera from Olympus. The third model in the range of cameras dubbed OM-D, the E-M5 Mark II is a classically styled 16.1 megapixel model that offers the world's most effective 5-axis image stabilisation system, rated for up to 5-stops of compensation and effective for both stills and movies and any lens that you attach to the camera. The new OM-D Movie Mode offers multiple video frame rates (60p, 50p, 30p, 25p, 24p) and bit rates up to 77 Mbps, plus focusing during video capture via the new 3-inch touch-sensitive, vari-angle LCD screen. In the High Resolution mode, the 5-axis image stabilisation system can capture 40 megapixel JPEGs and 64 megapixel RAW files by moving the sensor between each shot and merging eight single exposures into one during the course of 1 second. Other key features of the Olympus OM-D EM-5 include a dust- and splash- proof magnesium-alloy body, 2.36 million-dot Electronic Viewfinder with eye-detection, 10 frames per second burst shooting, TruePic VII processor, a sensitivity range of ISO 200-25600, 81-point area auto-focus system, in-camera keystone compensation, built-in WiFi for remote control shooting and sharing, a mechanical shutter and fully-electronic shutter mode with speeds of up to 1/16000 second. The Olympus OM-D E-M5 Mark II is available in silver or black for £899/$1099 body-only. At first glance the new Olympus OM-D E-M5 Mark II looks very similar to the 3-year-old E-M5 that it replaces, but underneath the slightly revised exterior are a host of changes that bring this camera bang up to date. With silver/black or all-black body choices offered, we had the latter version of the E-M5 Mark II in for review, along with the M.Zuiko DIGITAL ED 12-50mm f/3.5-6.3 kit lens. Feeling very robust and reassuringly solid in the palm thanks to the magnesium-alloy body which boasts the same dust and splash-proof capability as the flagship E-M1 camera, the E-M5 Mark II's dimensions are 123.7 x 85 x 44.5mm, so it's definitely one for a camera bag rather than pocket if the kit lens remains attached, with a body-only weight of 417g. Starting from the front, the E-M5 Mark II has a re-programmable depth-of-field preview button located to the bottom-left of the lens mount, a round lens release button to the right, plus a new flash sync terminal and an AF assist lamp above interrupting the otherwise feature-less faceplate. The flash sync terminal allows the use of mains flashes and other cable-contact flash units via a standard sync cable. Olympus specifies an x-sync speed of 1/320s with the FL-LM2 and 1/250s with other external units. The E-M5 Mark II's handgrip is slightly different to its predecessors, featuring a more curved design that runs towards the lens mount and an the use of a different, more leather-like texture, with just enough room vertically to accomodate three fingers. Most image stabilization systems compensate for camera shake by correcting yaw and pitch. Olympus claim that camera shake is actually caused by five different kinds of motion, and their image stabilization mechanism additionally corrects for horizontal shift, vertical shift and rotary motion (rolling) for both still images and movies. The E-M5 Mark II now offers an incredible 5-stops of compensation complete with auto panning detection, with Olympus claiming that handheld shutter-speeds as low as 1/4 second are obtainable. The Olympus OM-D E-M5 Mark II can cleverly create a 40 megapixel JPEG or a 64 megapixel RAW file in the High Resolution mode, achieved by shifting the sensor in half-pixel steps and capturing eight images over a period of one second. Olympus recommends that you mount the camera on a tripod or other stable surface to obtain sharp results and also that your subject should be static, although they have already hinted that in the not-too-distant future you'll be able to hand-hold the camera when using this mode. Note that you need to download the "Olympus High Res Shot Raw File Photoshop Plug-in" to open the RAW files in CS5 or newer 64-bit Adobe Photoshop. 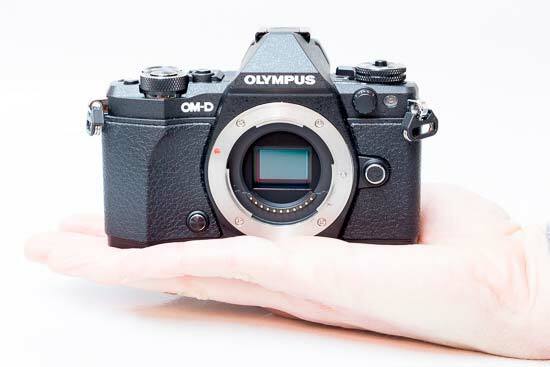 Focusing is another area where the Olympus OM-D E-M5 II has been significantly improved. The number of selectable AF points has been expanded to 81 in a 9x9 grid versus the E-M5's 35. Low-light auto focus continues to be excellent – the system managed to focus down to -2EV (as long as there was something to focus on) even without the use of the focus assist lamp. This is seriously low light, about the same as a landscape lit only by moonlight and nothing else. It doesn't include the 37 on-sensor phase-detection auto focus points that the flagship E-M1 offers, though. The continuous shooting speed has been increased too, to 5fps with auto focus (up from 4.2fps on the OM-D E-M5), and 10fps without. Manual focus enthusiasts will be delighted to learn that the Olympus E-M5 Mark II has a focus peaking feature, which enables precise focusing even without magnifying into the live view feed, although we would love to see a few more options for the outline colour. On the top is a vacant flash hotshoe that sits directly above the lens, with a partially recessed shooting mode dial on the left hand-side when viewed from the rear. The coin-like dial has a surrounding ridged edge for easier purchase and a new locking button at its centre. On most other cameras that have a lockable dial, you need to hold down the centred button while turning the dial – on the Olympus OM-D E-M5 Mark II, the mode dial locks with one press of the locking pin and unlocks with a second press, which is a clever idea. The shooting mode options remaining the same as the original E-M5's, being program, aperture priority, shutter priority, manual, video, scene modes, Art Filters and - the most obviously highlighted of all - iAuto mode. The power switch has been relocated from the rear of the camera to the left-hand side of the flash hotshoe. The placement of the on/off switch might well raise a few eyebrows as it means you will almost always need to use your left hand to turn on the camera, which is hardly an ideal solution. Actually, this is a design nod to the Olympus OM-1 film camera that had its power switch in virtually the same location – which is all nice and well, but we’d still prefer it to be in a position where you can easily reach it with your right thumb or forefinger. There are now 14 Art Filters in total, with Dramatic Tone and the self explanatory Gentle Sepia working the best for us, the former adding an intensely gritty look as if a photograph has been photo copied and vividly hand coloured. The Art Filter digital effects are applied at the time of capture which means write speeds are inevitably a couple of seconds longer than for regular images. When shooting using certain filters, such as Diorama or Dramatic Tone, the screen's refresh rate slows, providing a real time preview of how the eventual image may look. Over to the right of the external flash hotshoe are a small-ish shutter release button, with the Olympus OM-D E-M5 Mark II readying itself for action in a second or so. Squeeze down halfway on the shutter release and the E-M5 Mark II quickly responds thanks to the new TruePic VII processor, the screen almost imperceptibly blurring before snapping back into focus, with the AF point flashing up in green with an accompanying bleep of confirmation. The E-M5 Mark II certainly delivers in terms of focusing speed and perhaps more importantly accuracy too, with very few false positives. Take the shot and when shooting RAW and Fine (top quality) JPEG in tandem there's a wait of an acceptable three seconds before the shot is fully committed to the memory card. Buffer memory is such however that you don't have to wait that long to squeeze off another shot if the opportunity presents itself. Action photographers will appreciate the headline grabbing burst rate of 10fps, although that's only achieved by locking the focus point at the first frame of the sequence - the EM-5 Mark II performs at a more modest maximum speed of 5fps when auto-focusing. The wi-fi implementation on the OM-D E-M5 II is actually quite good. You first need to download a free app for your smartphone (Android and iOS versions are both available), but after that, everything is pretty straightforward. You simply touch the Wi-Fi icon on your camera's display to set up a connection. The Olympus OM-D E-M5 Mark II will provide you with an SSID and password, but you do not need to type in either of them – just launch the app on your phone and scan the QR code displayed by your camera with your phone. This is nearly as fast as using NFC (Near-Field Communication), a feature that the OM-D E-M 5 Mark II doesn't offer. Once the connection is established, you can download images from the camera to your smartphone, or use the latter to remotely control the camera. The level of control provided is quite good – you can choose from a variety of shooting modes, set aperture, sensitivity, shutter speed and white balance, choose a drive mode, and focus on practically any part of the frame, all remotely. The Olympus E-M5 Mark II has a time-lapse photography mode, which allows you to capture up to 999 frames at user-specified intervals. You can also tell the camera when to start the sequence, which comes in handy if you want to set up the camera well in advance. The E-M5 Mark II will save each shot in the format of your choice – ORF or JPEG – and can optionally create a time-lapse video in-camera, which you can play back on the rear screen, or upload to a website like Vimeo or YouTube. While shooting raw and creating a video afterwards on your PC gives you more control over grading, sharpening etc., the in-camera option is nice to have when shooting JPEG or raw+JPEG, as it is obviously much faster. The shutter release is encircled by the first of two command dials. 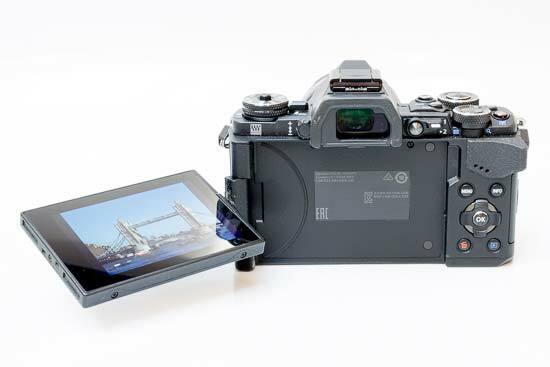 The Olympus OM-D E-M5 Mark I inherits the 2x2 Dual Control system first seen on the Pen E-P5. This comprises two top-mounted control wheels and a function lever on the rear that’s pretty easy to reach with your right thumb. The function lever has two settings. In the first position, moving the control dial on the front of the camera adjusts the aperture while the dial on the back adjusts the shutter speed. On the second setting, the dials change the ISO value and white balance respectively. You can also configure the switch’s operation too – for example, you can turn it into a handy AF/MF toggle if that makes more sense to you. Alongside is the non-specific, user attributable 'Fn2' function button, on our review sample sensibly given over to adjusting the ISO speed, along with new Fn3 button for changing the Display and Fn4 button for accessing the HDR options (both can be re-configured). Completing the EM-5's top-plate is a red video record button. The Olympus OM-D E-M5 Mark II can record Full HD movies at a variety of frame rates (60p, 50p, 30p, 25p, 24p) and either inter or intra-frame compression, and the highest bit rate has increased to 77Mb/s from 24Mb/s on the E-M5. The E-M5 Mark II can use its excellent 5-axis sensor-shift image stabiliser when shooting movies, which translates into smooth hand-held footage, even when using longer telephoto lens. Manual exposure can be enabled for videos, although you do have to rotate the mode dial to the Movie position to take advantage of this. (You can start filming in practically any other shooting mode too, but in that case, videos will always be recorded with auto exposure.) Audio is recorded in stereo PCM and uncompressed HDMI output is also possible, as is support for timecode. Shooting modes include Aperture priority, Art Filter, Manual, Program and Shutter priority, while one-shot echo and multiecho effects can be added to movies. Moving to the rear of the E-M5 Mark II, we find the built-in electronic viewfinder complete with diopter control to the left. 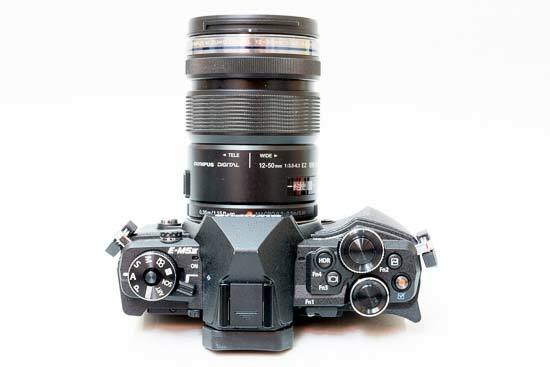 Note that the E-M5 II no longer features the manufacturer's second-generation accessory port beneath the hotshoe, so you can no longer attach a variety of optional peripherals such as a Bluetooth adapter, an external microphone adapter kit or the MAL-1 Macro Arm Lights. Instead of a built-in pop-up flash, the EM-5 Mark II is supplied with the diminutive new FL-LM3 unit (guide number of 9/m at ISO 200) which clips into the external flash hotshoe and the accessory port, much like the flash on Sony's NEX cameras. While many will bemoan the lack of a true built-in unit, thankfully Olympus have chosen not to sell it as an optional accessory, and it does have the same dustproof and splashproof construction as the camera body. Plus it can now swivel and tilt for bounce flash and act as a wireless controller for off-camera flash. It may make the OM-D EM-5 Mark II look a little top-heavy when fitted, but at least you have the choice of whether to use it or not. 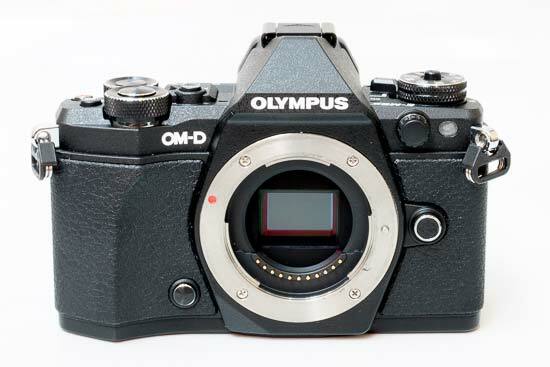 The Olympus E-M5 had a pretty decent finder – with a resolution of 1.44 million dots, 1.15x magnification and an 18mm eyepoint –, but the EVF on the OM-D E-M5 Mark II is all-around better, offering a 2.4-million-dot resolution, 1.48x magnification and a 21mm eyepoint - it's actually the same EVF as found on the flagship OM-D E-M1. All these specifications translate into a much improved viewing and framing experience that rivals – and in some respects outclasses – the best optical viewfinders found on any cropped-frame DSLR. The EVF also benefits from the addition of Adaptive Brightness Control, which contributes to an improved viewing experience. Also the finder now has an eye proximity sensor that allows the camera to switch from the LCD screen to the EVF automatically when you lift it up to your eye. Like the E-M1, the E-M5 Mark II's electronic viewfinder “gains up” in low light, making it arguably more usable than an optical finder. The EVF helpfully displays key shooting information along the bottom of the viewfinder, and you can preview manual and creative adjustments live through the EVF without having to lower the camera to look at the rear screen. The camera's back is dominated by a large, articulated rear screen. Unlike the E-M5, this is not an OLED panel but an LCD – with a considerably higher resolution (1,037,000 vs. 610,000 dots) and capacitive touchscreen technology. As the monitor is now side-mounted, the degree of articulation has also been greatly improved – it's now a fully articulated vari-angle display that can be rotated to the front for easier selfies and closed against the rear of the camera to protect the screen. The E-M5 Mark II is the latest Olympus compact system camera to feature touch screen operation, although if you're not a fan you can for the most part get away without using it much at all, as there are a plethora of physical buttons which are either dedicated to specific functions or can be customized to suit. Indeed, the touch-sensitive interface hasn't led to a cleaner or more pared-down minimalist look. Dragging a finger, and so the AF point, around the screen is a quick and easy way of following the subject, though inadvertently subsequently tapping it will cause the shutter to fire. This facility can be deactivated by prodding the relevant shutter button icon on the touch screen, but it's just as easy to accidentally turn it on again; even via an action as incongruous as the button of your shirt connecting with the screen as you're wearing the E-M5 Mark II on a neck strap, or the thumb of your left hand straying as you handle the camera. To the right of the EVF is the function lever for the 2x2 Dual Control system. Just below this control and the usefully protruding thumb-rest are dedicated and self-explanatory Menu and Info buttons, the latter toggling through various LCD views. 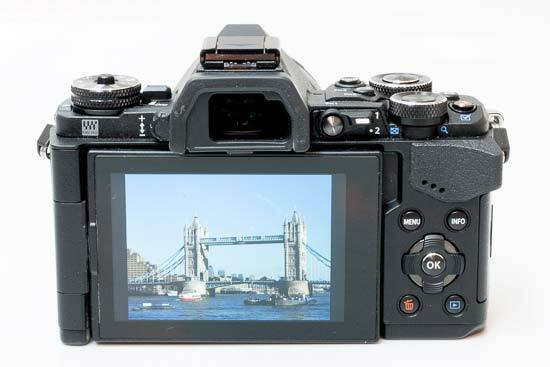 Underneath again is a option-less 4-way navigation controller with a central OK button - pressing this accesses the E-M5 Mark II's quick menu system, a handy onscreen grid of icons that provide quick access to most of the camera's main settings. In conjunction with the camera's plethora of external controls and its customisable buttons, this makes the E-M5 Mark II a pleasure to use. The final controls on the rear are the Delete button and Playback buttons. Chunky lugs for attaching the supplied shoulder strap hang at either side of the camera, thankfully out of the way of fingers and controls. On the left hand flank, if viewing the camera from the back, we find a pair of covered ports for joint USB/AV output and mini HDMI output respectively, along with a new standard 3.5mm stereo microphone jack. On the right is a flip open cover protecting the memory card slot. There is the option here to use all varieties of SD media card, up to and including SDXC cards. On the bottom of the EM-5 Mark II is a screw thread for attaching a tripod, with the lockable battery compartment alongside. The BLN1 rechargeable lithium-ion battery supplied with the E-M5 Mark II is good for around 310 shots, slightly down from the E-M5.